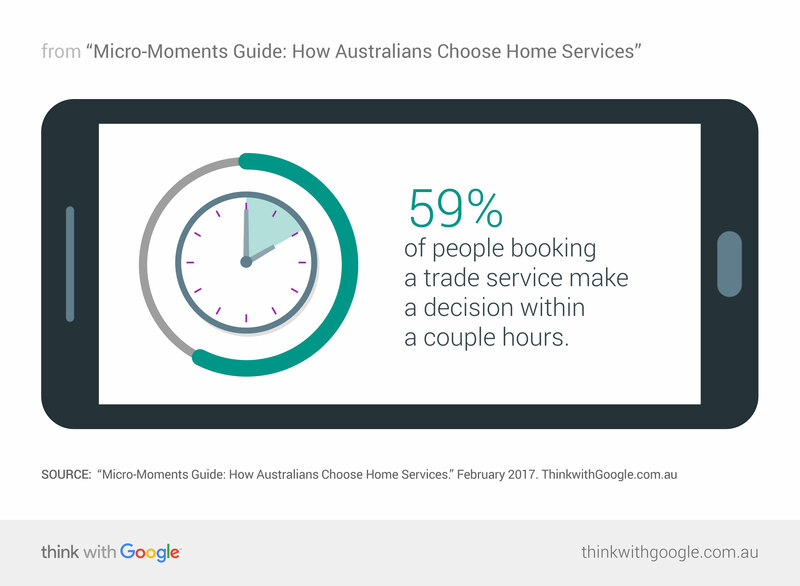 In part two of our micro-moments series, we have new research on how Australians find and choose home services providers. We also have practical actions your business can undertake to reach—and win over—consumers when they turn to their smartphones. Australians seek out home services businesses for all sorts of needs: cleaning, gardening, plumbing, electric, pet sitting, computer repair, and general fix-its. Using data from recent qualitative and quantitative research studies, we'll take you through what this decision-making process looks like for Australians, and provide insights on how your local business can meet their needs in each micro-moment along the way. In some cases, home services are still considered a luxury. When it's a service that requires expertise like plumbing or electricity, our respondents said they're more likely to get help quickly. For other services, they may be willing to pay for help around the house, but they're cost-conscious and need to get used the idea. Be there for common searches: Consider the most common searches performed by people looking for home services and identify which are most relevant to your business. Are you there for these search results on mobile, and do you like what you see? Establish trust: On your website and in your ads, introduce your service and what the experience will be like. The more people know what to expect from you, the more comfortable they’ll be booking your services. Think about a consumer deciding between two electricians. They're probably more likely to go with the business that has details readily available, such as what's included in a free consult, what its areas of expertise are, and when its people are generally available. Once consumers find a service that meets their needs, they decide quickly: 59% of people booking a trade service make a decision within a couple hours.2 So information must be thorough and immediately available. Turn on reviews: Make it easy for consumers to choose you by letting others speak on your behalf. Provide helpful content: Create simple content that speaks to consumers' needs and answers their questions. Where possible, offer a simple price list to give people an idea of what your services will cost. Have a local presence: 61% of smartphone users say they're more likely to buy from companies who customise mobile information to their location,2 so ensure your online business listing is updated and you have a strong presence on mobile search. Highlight your services: Use pictures and videos to show your services and what they entail. Australians will consider three service providers on average, and contact two.2 These moments when consumers reach out for information are crucial for winning their business. Many large companies have online booking or instant quote tools, so smaller businesses need to be quick to respond to enquiries, especially on the phone. Consumers like to call businesses to get fast answers, and 66% of Australians say it's extremely or very important to have the ability to call a business directly from a smartphone search results page. Respond quickly: Consumers become frustrated if they have to wait for callbacks or responses, so ensure you have a system in place to get back to interested consumers quickly. Click-to-message ads, for example, can give consumers a quick and easy way to speak to your business. Eliminate steps on mobile: Think about what you can provide on mobile to move people closer to booking your services. That might mean helping the consumer fill in forms, building an online booking system, or enabling people to reach you quickly with click-to-call buttons. 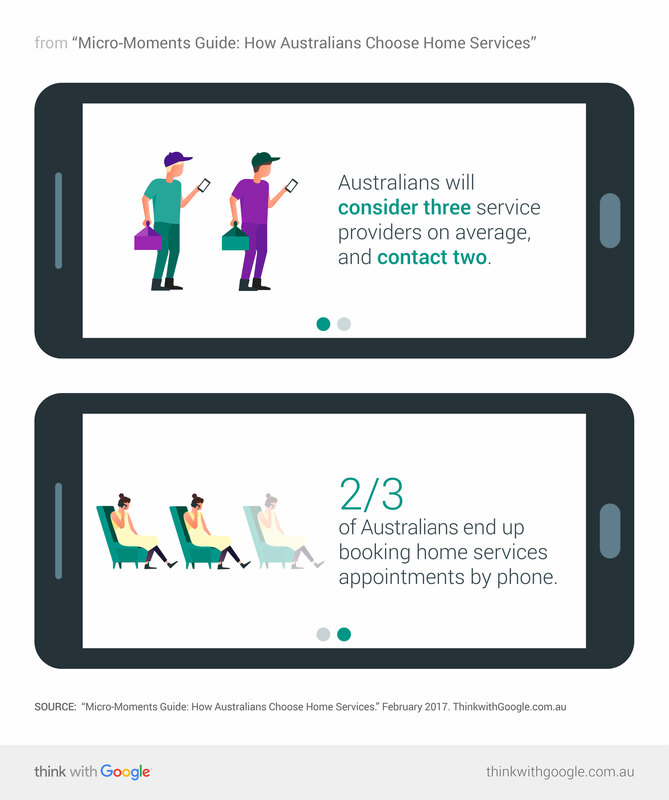 For home service needs big and small, Australians are relying on mobile to help them find what they need. All these micro-moments along the way can mean big things for your local business if you can find ways to provide helpful and detailed information, get back to people quickly, and make it easy for them to book an appointment and choose you. 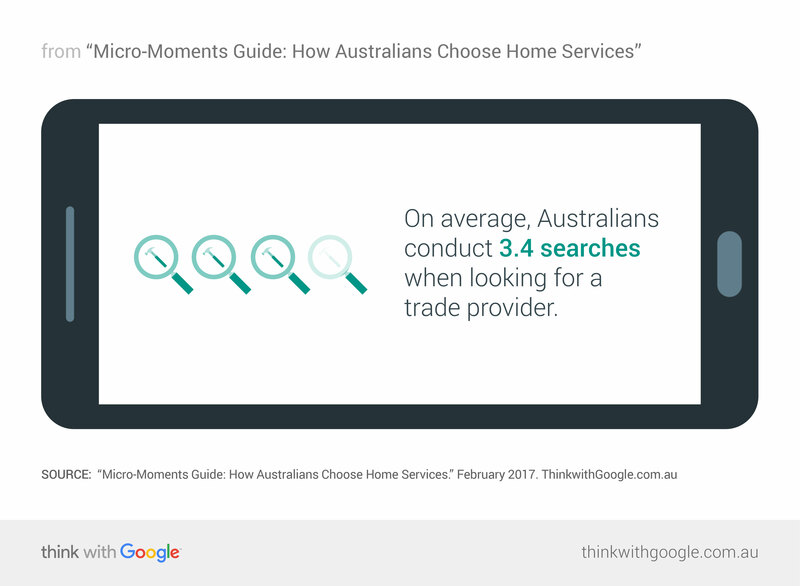 Google partnered with TNS Australia in October 2016 to conduct qualitative research with n=30 18–54-year-olds across Australia, around how consumers research, shop for, and purchase a range of categories. This research supports a variety of other quantitative studies (sourced below) in order to gain a deep understanding of category specific micro-moments. 1 Google/Galaxy, "Consumers in the Micro-Moment," June 2015, Australia, n=769 smartphone shoppers. 2 Google/TNS, “SMB Path to Purchase,” 2015, Australia, n=258 recent purchasers of trade services.